The University of New Brunswick is cracking down on dogs and mountain bikers in its woodlot south of Knowledge Park Drive in Fredericton. 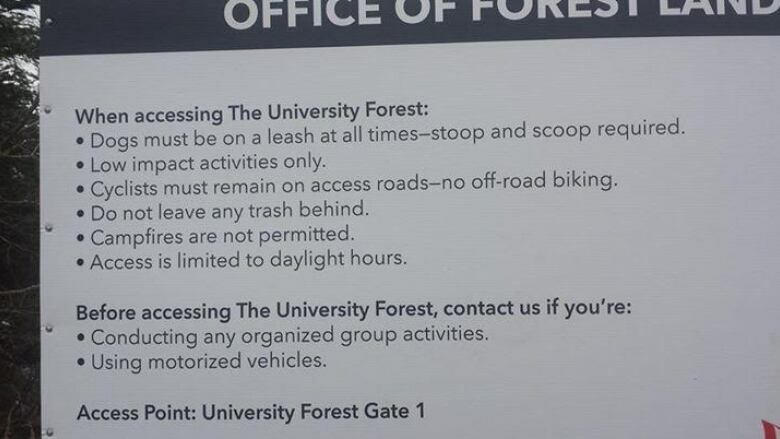 Signs have been put up at the entrances saying all dogs must be on leash, owners must stoop and scoop, and mountain bikers must stay on the main trails. Jason Golding of UNB says the signs are needed to make the woodlot safer for students and other groups that have agreements with the university. Golding is in charge of forest operation planning at UNB and says he fields calls weekly during the summer from people complaining about dogs running wild in the forest. It's been getting worse in the six years he's been on the job, he said. "Although I'm a capable guy myself, I've come across some aggressive dogs in the woods," said Golding. "It's not pleasant, to the point where you do meet the dog owner, who could be a couple of minutes behind, they're irate that I would even bring it up to have a dog on a leash." "I think this is just courtesy. It's similar to Odell Park, right? Dogs don't run loose in Odell Park and I think as users of private property, I don't think it's too much to ask to have your dog on a leash." Golding notes there's a dog park right across the street. He says there's also about 45 kilometres of trails through the woodlot that are available to mountain bikers. They're being asked to stay out of streams and brooks through the conservation forest. Golding says the university has also been dealing with some unwanted overnight campers, including one man who has been living there off and on for the past year. He wants to remind woodlot users that campfires and nighttime access are also banned.